Norwich — Those familiar with the system know it’s not uncommon when a protective order fails to protect. Shortly before 10:30 p.m. Saturday, that scenario played itself out again as Brandon Uzialko burst into the home of his ex-girlfriend, Sonia Fowler, and began stabbing Carlos Gayle. Multiple children were inside at the time. Uzialko, who was facing several charges after he allegedly choked and assaulted Fowler in August 2016, had been ordered by the court to stay away from Fowler’s 67 Quarto Road residence. That order did not prevent Uzialko from sending Gayle to an intensive care unit with life-threatening injuries. Less than three days later, Uzialko himself was dead. He was 25. Details about his death remained scarce Wednesday evening. Police said Uzialko and at least one Norwich officer traded gunshots early Tuesday night, as officers attempted to take him into custody in the Greeneville section of the city. Citing a pending examination by the state Office of the Chief Medical Examiner, neither state nor city police would say how Uzialko died. They also wouldn't say whether Uzialko had gunshot wounds when they found him, hours after the shots were fired, near the intersection of 13th and Prospect streets. Because an officer was involved, Norwich police Chief Patrick Daley said, the Windham County State’s Attorney’s Office is investigating the incident. State law calls for such investigations to be conducted by an entity outside the immediate vicinity to avoid conflicts of interest. Daley said the male officer has been placed on paid administrative leave while the investigation is conducted, which is standard practice. The medical examiner's office had no information Wednesday on the status of the scheduled autopsy. Police on Monday had asked the public to keep an eye out for Uzialko, who they said was armed and dangerous. A tip from someone who saw Uzialko launched the chase through Greeneville that began about 6:30 p.m. Tuesday. On Wednesday, residents of Greeneville still were surprised by what transpired the previous night. Rick Irwin, who lives on 13th Street, said he was home when the pursuit began and heard several gunshots. Like other residents in the area, he was asked to stay inside. But from a window he recorded several videos of officers and police vehicles and posted them to Snapchat. He described the event as "crazy." Patricia Bapst, a woman who also lives on 13th Street, said officers had canvassed many yards, including hers, in search of anything Uzialko may have dropped. Behind her, officers and troopers could be seen scouring the ground from 11th to 13th streets between Boswell Avenue and Prospect Street. Bapst said she didn't witness the shooting or pursuit because she wasn't home when it happened. She said she was asked to stay in a parking lot off Central Avenue and wasn't allowed to return to her house until about 3 a.m., when an officer escorted her there. "It's weird because this is actually a really good neighborhood," she said. "Everybody gets along, everybody knows everybody for the most part. We have a couple of rough spots, but all diamonds do." Court records show Uzialko had two pending cases at the time of his death: one for simple trespass and the other for second-degree strangulation, third-degree assault, disorderly conduct, interfering with a 911 call and third-degree criminal mischief. In both cases, Uzialko had been released without bond on a promise to appear for his court dates. According to the protective order issued in the 2016 strangulation case, Uzialko and Fowler shared a child. Archives of The Day show the child was born in February last year. But that child wasn’t the only one in Sonia Fowler’s home. She also has two children, ages 4 and 7, with her ex-husband, Justin Fowler of Norwich. Justin Fowler said he began dating Sonia around 2009, when she was 18 and he was 24. They later married, but called things off in March 2015. According to Justin Fowler, Sonia had dated Uzialko in high school and brought him back into her life after her divorce. He and Uzialko never got along, Justin Fowler said, primarily because Uzialko didn’t want him to stay in touch with the family. When the strangulation incident occurred — Uzialko pushed Sonia Fowler down the stairs before choking her on the kitchen floor, according to police documents — it was Justin Fowler who came to take the kids away from the home. “I knew something bad was going to happen eventually,” he said. Justin Fowler said Gayle and Sonia Fowler recently started dating and were sleeping in her home when the attack began on Saturday. He said his daughter was there and saw what happened. She has been having nightmares. His reaction to the news of Uzialko’s death? According to Justin Fowler, Uzialko had two other sons, with full custody of one. He said Uzialko appeared to be a good father to the latter. On Wednesday, police said Gayle, the stabbing victim in Saturday's incident, had stable vital signs and was conscious and alert. He remains in an intensive care unit at an unspecified hospital. The Quarto Road home, which is the left half of a duplex owned by the Norwich Housing Authority, was quiet. A piece of plywood covered an entryway on the left side of the home; children's toys lay scattered in front of the porch, left behind. Housing Authority Executive Director Charles Whitty said the stabbing incident would not prompt any security changes at the authority's several hundred housing units, where some security cameras already are in place. Whitty additionally said the authority has had excellent response from police to security issues on its properties. "Security cameras are expensive," he said. "Unfortunately, our resources are dwindling, not increasing." Prior to Tuesday's manhunt, Norwich police had been involved in several incidents in which officers fired shots at suspects. Most recently, on Jan. 22, an officer fired at a fleeing suspect following an armed robbery at an Occum deli. The suspect allegedly had pointed his handgun at the officer, but officers’ shots apparently missed. The man turned himself in two days later. 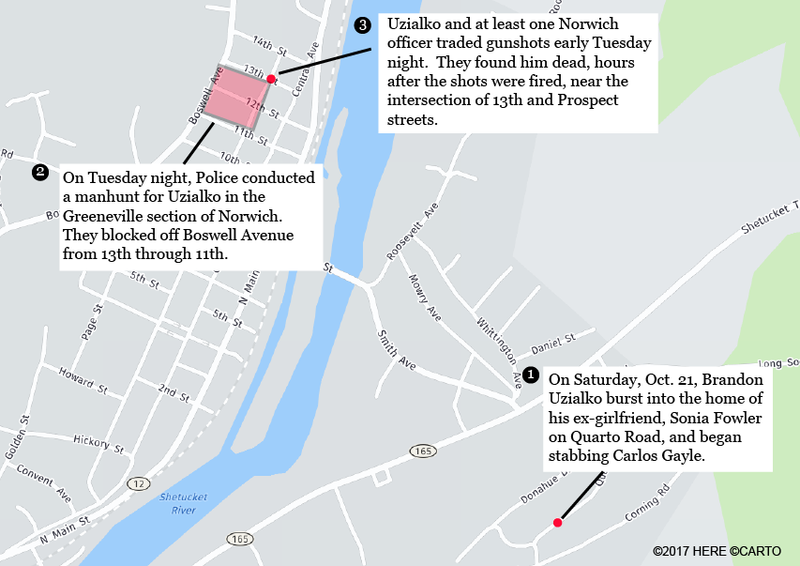 In a yearlong period from February 2012 to February 2013, Norwich police had four so-called officer-involved shooting incidents, one resulting in the death of a man who reportedly had pointed a gun at several officers. Daley, who was promoted to chief a year ago in September, launched a program to update the department’s use-of-force policy. He added de-escalation training for all officers, which took place in March, and incorporated language on “the sanctity of life” to the policy. “The lives of police officers and the lives of the people we serve are fundamentally important in the Norwich Police Department's mission to serve the public and our community,” the new wording states. Daley said the bulk of the use-of-deadly-force policy remained the same and is based on court guidelines. The department defines deadly physical force as action that can be reasonably expected to cause death or serious physical injury. Police also may use deadly physical force to prevent the escape from custody of a person the officer believes has committed or attempted to commit a felony involving serious injury or threatened serious injury. Although he could not comment on specifics, Daley said Norwich officers and mutual aid departments that assisted in Tuesday’s prolonged chase and lockdown performed well.